A COMMERCIAL transaction normally commences with due diligence being conducted prior to much consideration being put into the written agreement. This measure has two effects – it prevents the parties from sealing a detrimental deal and also time wastage over unfruitful discussions. Essentially, this is an important process to ensure the parties get what they exactly bargained for. The same is applicable in the purchase of new residential properties from developers. While there have been incidents of abandoned housing projects all over Malaysia that impacted the homebuyers who spent their hard-earned money but did not get their dream home in return, generally the housing authorities had been successful in protecting the interest of house buyers. Many of these projects were abandoned by illegal developers who did not possess any valid licences to commence the development in the first place. The Urban Wellbeing, Housing and Local Government Ministry’s website showed there were 82 developers without licence and 116 developers who have abandoned their projects as of June 30, 2014. The question that remains is how could the homebuying public be so ignorant that they are incapable of doing the basic due diligence when making the biggest life-long investment of buying a dream home. Under the Housing Development (Control and Licensing) Act 1966 (HDA), any developer who constructs and sells more than four units of housing accommodation comes under the purview of the HDA. Section 18 of the HDA states that any housing developer who carries out housing development without having been duly licensed shall be guilty of an offence and shall, on conviction, be liable to a fine which shall not be less than RM250,000 but not exceeding RM500,000 or jailed not more than five years or both. ·Apply for a sales and advertisement permit to start selling the units of the development. Thus, a licensed developer would pass the first stage, with checks by the relevant authorities. A unlicensed development would mean these authorities are out of the picture and that development had not been discovered for breach yet. As such, the next level of due diligence will be significant: the homebuyer himself. With the advancement in wireless technology today, we “google” for everything for which we need clarification and information. The same applies for home purchasing. You will be amazed over the amount of information available online: ranging from the developer’s own website, property reviews to forums started by other homebuyers on the same development. While it is not advisable to believe everything from the world wide web, it serves as a good starting point to know better the product you are buying before signing the sales and purchase agreement. In addition to that, you may personally pay a visit to the development itself and make your own observation. If possible, asking around for details would also build up the confidence in buying the right home. Normally, at the entrance, there will be a white signboard feeding you details of the construction such as the details of the development, landowner, developer, contractor and completion date. Your lawyer or banker also serve as another filter of due diligence. Before you sign any agreement, it is advisable to ask them on any doubt that you are suspicious about and to be comfortable with what you sign. Even if you have questions on the credibility of the lawyers, the Bar Council has a website for you to do the checks or even its friendly help desk in its office. The above due diligence process does not guarantee a 100% smooth property transaction but it minimises the risk of buying a project which could be abandoned. Besides conducting a detailed research, the purchase of a house from reputable developers may diminish your homebuying risk further. And for any of you who think you might be a victim of unlicensed developer, it is time to call your lawyer and banker for clarification. Owning a house is a lifetime commitment; its protection starts with you. 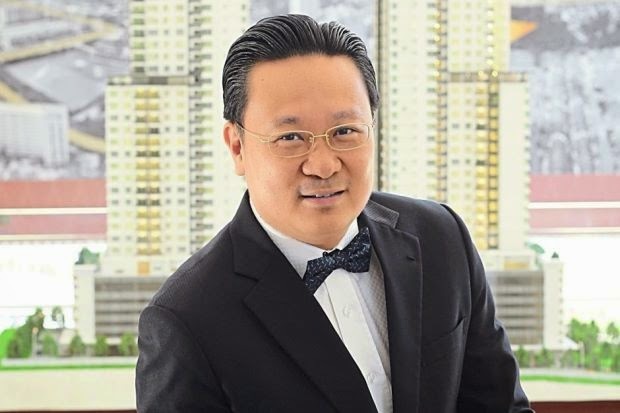 NEWLY-LAUNCHED property units are not flying off the booking boards in the showrooms this year, but sales are “at a healthy level”, according to Orando Holdings Sdn Bhd managing director Datuk Eng Wei Chun. Having entered the property development scene in 2005, Orando has witnessed the peak of the Malaysian property market when launches were sold out within days or even hours as well as the softening of the market as Bank Negara tightened the reins on financing. But Eng is not fazed. “The current level of tightening measures to curb price speculation is just nice, any more and the property market could suffocate,” Eng says, donning his trademark accessory – the bowtie. He adds that with a young and growing population, it will not be that easy for the Malaysian property market to suffer a bubble. Earlier this month, Orando launched its sixth project Villa Crystal @ South Desa Park, in Taman Sri Sinar, Segambut, Kuala Lumpur. The condominium project comprising 414 units on 38 storeys is already 60% sold thus far. Given the current market momentum, Eng estimates the entire project would be sold in another few weeks. In his promise to provide “Swiss-watch quality” homes, he says the company believes in building responsibly. “I don’t think we should talk only about returns, as businessmen. We should create something of value for society,” he tells StarBizWeek. This year, Orando has won three awards – the European Quality Award from the European Business Assemble Oxford, UK; the Five Star Best Residential High Rise Development Award and the Safe Home Award for its Vila Vista project under the Asia Pacific Property Award 2014. Villa Crystal is sited on 3.5 acres of freehold land a stone’s throw from Desa Park City, Taman Tun Dr Ismail and Kepong. The gross development value is RM310mil. “There is a link currently being built from Desa Park City to this area. When completed within three years, it would take only five minutes to drive from Desa Park City to Villa Crystal,” he says, adding that the link will lead to the Damansara-Puchong Highway. Villa Crystal units are going for around RM515 per sq ft, or between RM700,000 and RM1.2mil. The built-up ranges from 1,155 sq ft to 1,614 sq ft. The bigger units come with three parking bays while the smaller ones have two. “We are selling at the current price, not the future price,” he says. Its selling points are its high ceiling and a multi-purpose area taking up 10% of floor space in each unit which the home buyer can customise into anything, from a wine cellar to a personal hideout. The area also has its own entrance, therefore homeowners can divide the space for a tenant or the domestic helper. Although Orando has a little more than a handful of projects under its brand, it has plans to venture beyond the Klang Valley... into the United Kingdom. “When we were there to accept our award in April, we met some potential contacts for future ventures. We’re still exploring the idea of London,” he says. Eng has been in talks with a landowner in London and thinks the growth into the British market could be next year, after some feasibility studies. For now, the company’s strategy is still to hunt for pockets of land in the Klang Valley to develop as soon as possible. Orando does not have any projects or land bank beyond this area, currently. Eng says the group’s formula is to build one project, launch another and keep a parcel at any one time. Another strategy for the company is to introduce new products into the areas it ventures into, so as to not create unhealthy competition among developers providing similar products. “When we launched the grand lobby condominiums in Cheras, there was no such development in that area then,” Eng says. He puts it neatly: People sell apples, I sell oranges. To come up with fresh ideas that locals of any area would be receptive to, Eng studies the society of that area in order to understand what it demands or lacks. He explains that Segambut and Kepong, being 40-year-old townships, have second and third generation dwellers looking to upgrade. “The younger generation are beginning to settle down. They want to upgrade but don’t want to move too far away from their parents. And there is not many luxury condominiums in these areas,” he says. Eng says the buyers’ profile for Villa Crystal has been largely people in their late twenties and thirties from Kepong. Orando’s previous high rise residential projects include Vistaria and Vila Vista in Taman Pertama, Cheras. PETALING JAYA: Plenitude Bhd’s wholly-owned subsidiary Plenitude International Sdn Bhd has entered into a sale and purchase agreement with the Employees Provident Fund (EPF) for the proposed acquisition of a 259-suite hotel, known as the Gurney Resort Hotel & Residences in Penang, for RM160mil. In a filing with Bursa, Plenitude said Gurney Resort Hotel formed part of Menara Gurney, which is a 37-storey building with one basement level, a hotel along with retail and office components. The retail units are located on the ground to second floor of the retail podium. The hotel has retail units and 551 car park bays. The hotel is located approximately 4km to the north-west of the Penang ferry terminal and 3km from the state administrative centre in Kompleks Tun Abdul Razak. Plenitude said that the price tag of RM160mil was arrived at after taking into consideration the strategic location of the property and the market value of the hotels in the surrounding vicinity. “The proposed acquisition represents an opportunity for the company to expand its hotel business and operations, where the group currently owns Four Points by Sheraton Penang. It is expected to contribute positively to our future earnings,” said Plenitude. Plenitude was down four sen to RM3 on volume of 510,200 shares. The company is in a financially strong position with no debt. Its cash and cash equivalents amounted to RM386.9mil as at March 31, 2014. For the third quarter to March 31, 2014, Plenitude’s net profit was up 89.3% to RM23.14mil on the back of a 80.58% increase in revenue to RM72.7mil. KUALA LUMPUR: Malaysian Resources Corp Bhd (MRCB) is buying the 51 per cent stake held by Pelaburan Hartanah Bhd in Penang Sentral Sdn Bhd for RM50.75 million. Penang Sentral is a joint-venture company set up to implement the Penang Sentral project. After the payment, Penang Sentral will become a wholly-owned unit of MRCB. The acquisition will enable MRCB to better manage the operations and fast-track Penang Sentral project and improve the efficiency through single management structure. MRCB group managing director Tan Sri Mohamad Salim said this initiative will create a clearer way for MRCB with regards to the Penang Sentral project. “The project will also benefit in terms of the fast-tracking works that MRCB can now implement, especially in project management and coming up with a definite timeline and completion period,” he said in a statement yesterday. Penang Sentral is an urban development with mixed components built around the largest integrated transportation hub in Malaysia’s northern region. This mixed development is poised to transform Butterworth into a modern metropolis and will house retail, commercial and residential components. Penang Sentral is a phased development and is expected to be fully completed by 2030.